The revolutionary life insurance analytics software creator InforcePRO® announced today that it has adopted The Depository Trust & Clearing Corporation (DTCC) Insurance & Retirements Services (I&RS) solution to increase its carrier reach from 17 to 30 while enabling the first-ever direct linkage to carrier administrative systems of policyholder intentional data and agent activity reporting. “Bi-directional data-syncs with our carrier partners through DTCC’s I&RS enables InforcePRO to reach it’s strategic objectives of creating a single source of truth for policy changes, sales opportunities, and policyholder intentions in the industry, straight from the agent to the carrier’s administrative system,” said InforcePRO Co-Founder Cameron Jacox. DTCC has an exemplary track record of providing timely and accurate data feeds to the life insurance and financial industry. As InforcePRO’s newest data-feed provider, DTCC’s I&RS is helping accelerate InforcePRO's mission of making available the first ever broad-based and automated policyholder engagement platform. “Putting policyholders first is the life insurance industry’s most pressing challenge and InforcePRO’s most important goal. Creating transparency around policy status, performance, optionality and fit brings the entire industry forward by 30 years,” says Jacox. DTCC’s I&RS will help InforcePRO and 30 carrier partners to execute on the broad desire for revenue growth, retention and policyholder engagement. 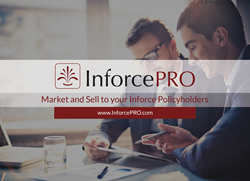 For additional information, including an on-demand demo of InforcePRO's innovative life insurance technology platform, visit https://inforcepro.com. InforcePRO® is the fastest growing software provider to the life insurance industry and has built an innovative web-based policy-monitoring tool that delivers increased revenue and enhanced protection from liability on orphan, as well as active books of life insurance business for Carriers and Distributors – and all while dramatically improving policyholder service to put Policyholders First™. With over 40 years of experience, DTCC is the premier post-trade market infrastructure for the global financial services industry. From operating facilities, data centers and offices in 16 countries, DTCC, through its subsidiaries, automates, centralizes, and standardizes the post-trade processing of financial transactions, mitigating risk, increasing transparency and driving efficiency for thousands of broker/dealers, custodian banks and asset managers worldwide. User owned and industry governed, the firm simplifies the complexities of clearing, settlement, asset servicing, data management and information services across asset classes, bringing increased security and soundness to the financial markets. In 2014, DTCC’s subsidiaries processed securities transactions valued at approximately US$1.6 quadrillion. Its depository provides custody and asset servicing for securities issues from over 130 countries and territories valued at US$64 trillion. DTCC’s global trade repository maintains approximately 40 million open OTC positions and processes roughly 280 million messages a week. To learn more, please visit http://www.dtcc.com or follow us on Twitter @The_DTCC.